Many people believe that if they become interested in Asian spirituality and medicine, that they have to give up the faith that they were raised in. The author suggests that spirituality is not an either / or choice. 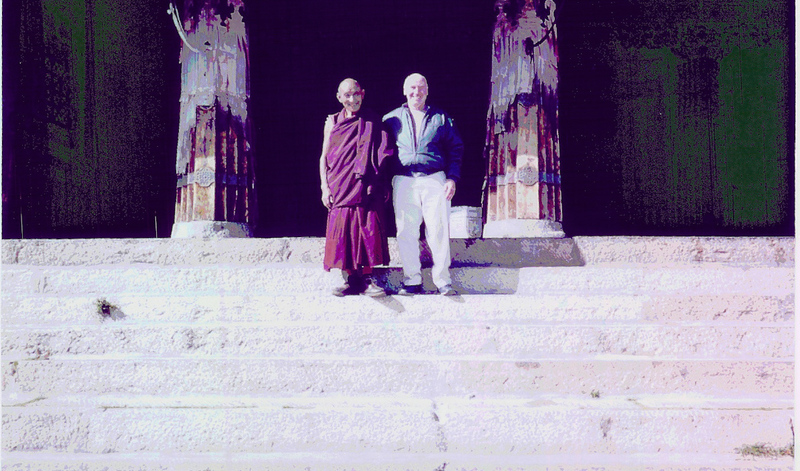 He sites the Dalai Lama and traditional Christian teachings to support his premise. - DID YOU START OUT CATHOLIC/CHRISTIAN? Brother / Doctor Bernard Seif, SMC, EdD, NMD is a Catholic monk and Clinical Psychologist, Board Certified in Behavioral Medicine. He is also a Doctor of Naturopathic Medicine specializing in Chinese Medicine. Doctor Seif practices and teaches a healing Asian art known as Medical Qigong, does spiritual direction, and enjoys giving retreats and workshops. He is a lifetime Professional Member of the National Qigong Association USA and Chair of their Ethics Committee. Brother Bernard has studied in both the United States and Asia and is well published in scientific and scholarly journals. Did You Start Out Catholic/Christian? On the way back to the airport, after four days of good-natured kidding about my Christian faith by a fellow board member during the 1998 National Qigong Association conference in Cleveland, Ohio, newly-elected NQA vice-president Ellie Christianson asked me to write a paper about the relationship between Qigong and Christianity. As I walked along Lake Erie the night before I told the Lord that if anyone asked me to do something for the NQA I would try to oblige. Ellie=s request was really a tall order! I have no axe to grind and it is not my intention to convert anyone to any belief system. If I can help others with a Christian background who might be shying away from qigong, the NQA, or other Eastern spiritual and/or healing traditions to be more comfortable then it will have been worth it. Since a fair amount of my AEastern@ time is spent at a nearby ashram and since I practice yoga on a regular basis, the context of this paper is largely from that tradition, but Chinese or Indian, the principals remain the same. The following is freely offered. Please accept it or reject it in spiritual freedom. Although Eastern spirituality and related healing arts have been an interest of mine for many years, and even though I bring a Christ-centered attitude to my practice of these wonderful gifts, I still get letters from time to time expressing concern for me from fellow Christians. The letters are very few indeed and the writers take little comfort in the fact that such greats as Thomas Merton and Bede Griffiths, both from the Christian monastic tradition, have traveled this path before me. This has prompted me to share just a bit of how the East has enriched my Christian journey. A time and place where East and West meet for me very powerfully is during my visits to the Kripalu Center for Yoga and Health in Lenox, Massachusetts. One of my early visits there went something like this. Relaxing bubbles of foam whirled around me. The warmth of the water soothed my runners legs. I was enjoying the therapeutic effect of the whirlpool more than the chat with the gentlemen I had just met. We were at the Kripalu Center. Kripalu is a large center for yoga and health, housing several hundred retreatants and vowed community members at any given time. It offers a wide range of physical, psychological, and spiritual development programs focusing primarily on spiritual and health issues. This community is housed in a former Jesuit house of studies. Saint Ignatius of Loyola, founder of the Society of Jesus, still graces the main chapel from the image in the blue mosaic behind the altar in the main chapel. Bapuji, a Hindu swami (monk) in saffron robes appears serene and offers a colorful complement through his portrait centered on the mosaic below Saint Ignatius. All at once a comment from my new acquaintance jarred me out of my whirlpool induced semi-reverie. ADid you start out Catholic? @ he asked. I lethargically told him that, yes, I did start out Catholic, and that I was still Catholic. He didn=t seem to understand. My companion reported that he too was raised a Roman Catholic and that his sister is a Religious Sister of Mercy , but they have great difficulty in talking about religion these days. He now practiced a very nebulous form of spirituality and she couldn=t relate to it and, obviously, remained in the Roman Catholic faith of her birth. Jesus is central to my life. I certainly don=t live up completely to the call of Christ to wholeness and new life, but I continue to try. I have always been fascinated by various forms of meditation and the spiritual traditions which reverence them, including Hinduism, Buddhism, Taoism, and Christianity. Cherishing my vocation as a Roman Catholic monk, I celebrate my relationship with these traditions as manifested in a deep friendship with Swami Tadatmananda and Arsha Vidya Gurukulam, an ashram about five miles from my Salesian monastery. My heart is also filled with gratitude for the opportunity I have had to study chi gong, yoga, tai chi, and zen, and even to visit Trappist, Buddhist, and Jesuit religious houses in Hong Kong. All of this has made the human and divine Christ more profoundly alive for me. It is my conviction that we do not have to give up our Catholic Christian heritage to enjoy the kinship and spiritual support of other traditions, in this case, Hinduism, Buddhism, and Taoism. This position is very well supported by the existence of an association known as the Monastic Interreligious Dialogue (MID). MID is made up of Hindu, Buddhist and Catholic monastics and lay people from throughout the world. The American bulletin for the association is published out of the Abbey of Gethsemani, 3642 Monks Road, Trappist, Kentucky, 40051-6102, FAX 502/549-4124. The members of MID share prayer and fellowship with one another. They also spend time living in one another=s ashrams/monasteries. A basic ground rule for the members of MID is that each individual person be first firmly rooted in his or her own spiritual tradition. This association is not out to convert anyone, rather, the members gather together for support on the spiritual journey and to help one another find the sacred. My thesis that one can be enriched by Eastern spiritual traditions without leaving Catholic Christianity is undermined by several inter-related misperceptions. Not only do many people believe that one must give up his or her Christianity to enjoy the treasures of the East, but many erroneously believe that Catholic Christians are not permitted to meditate. I have been asked about this on a number of occasions. Perhaps this attitude stems from the time of the Inquisition when anything that hinted of the mystical or contemplative was looked at with suspicion. Great mystics such as Saint Ignatius of Loyola and Saint Teresa of Avila had to do some fancy spiritual footwork to keep themselves clear of suspicion and were still indeed suspect. The condemnation of the practice of quietism has probably also contributed to this perception of meditation as a forbidden practice as well. The Church asks us to collaborate with grace, not sit back and wait for the Lord to do other things while we remain in some sort of passive stupor as did the quietists. Another common misperception on the part of Catholics and ex-Catholics, is that we have no real contemplative tradition. Many report that they never heard of Catholic Christians who meditate. One might find it shocking to learn that many are quite surprised to learn of the powerful and intrinsic history of meditation and contemplation which the Church has nourished and produced over the last two thousand years. We have our Jewish brothers and sisters to thank for giving us our contemplative roots. Growing up with Achurch on Sunday@ religion has not awakened many to this reality. The same holds true for the rich healing tradition in Catholic Christianity. Manifested first through qigong healing, then through the healings in the Jewish tradition, it continues in Christianity, e.g., the healing ministry of the charismatic renewal along with such healing cites as Lourdes and Fatima. The positive, and often misunderstood, attitude of Catholic Christianity to non-Christian religions is summed up very well in the document of Vatican II entitled the ADeclaration on the Relationship of the Church to non-Christian religions@ (Nostra Aetate). Please excuse the non-inclusive language of this English translation from the Latin. From ancient times down to the present, there has existed among diverse peoples a certain perception of that hidden power which hovers over the course of things and over the events of human life; at times, indeed, recognition can be found of a Supreme Divinity and of a Supreme Father too. Such a perception and such recognition instill the lives of these peoples with a profound religious sense. Religions bound up with cultural advancement have struggled to reply to these same questions with more refined concepts and in more highly developed language. Thus in Hinduism men contemplate the divine mystery and express it through an unspent fruitfulness of myths and through searching philosophical inquiry. They seek release from the anguish of our condition through ascetical practices or deep meditation or a loving, trusting flight toward God. Buddhism in its multiple forms acknowledges the radical insufficiency of this shifting world. It teaches a path by which men, in a devout and confident spirit, can either reach a state of absolute freedom or attain supreme enlightenment by their own efforts or by higher assistance. Likewise, other religions to be found everywhere strive variously to answer the restless searchings of the human heart by proposing Aways,@ which consist of teachings, rules of life, and sacred ceremonies. The unity of people throughout the ages who have sought the sacred is depicted so simply and clearly in the document cited above. Various cultures struggling toward the same end is seen as uniting humankind in one glorious search. Contemplation, philosophical study, and various methods of finding and expressing what is Atrue and holy@ are reverenced in this short but pivotal Church document. The fact that Christians see Christ as God and human does not negate the fact that God is revealed in other traditions as well. Encouraged by this world-wide official pronouncement, my recommendation to people on an individual level is that no matter what our spiritual tradition is, we all delve into the literature and practice of the contemplative tradition--which is really one for us all.. The contemplative tradition springs from one source--searching for the sacred here and now. Delve first into the writings and practice of your own tradition. With such a foundation newly discovered and firmly rooted, one then can be surprised and enriched by dialogue with other traditions. At the very least, one will be able to let go of some of the fear sometimes generated by being with people of a very different religious tradition. Specifically then, Hindus, Buddhists, and Taoists would do well to enjoy the spiritual writings and practices of the Christian saints, i.e., Saint Teresa of Avila and Saint John of the Cross, Saint Ignatius Loyola, Saint Francis de Sales, Saint Jane de Chantal, and Thomas Merton. Christians would do well to try to move beyond any prejudices or misperceptions they have about our Eastern sisters and brothers, prayerfully read a copy of the Bhagavad Gita or Merton=s The Way of Chuang Tzu, visit an ashram or read a little about Eastern traditions. If one enters deeply enough into prayerful silence, prejudices toward others (as well as toward oneself) can evaporate. Meditating with a group, and having a specific time and place for one=s own private meditation practice is extremely helpful in keeping one motivated to practice meditation. Being in relationship with a spiritual director, guru, or master, can help clarify experiences and guide the person praying in ways consistent with his or her tradition. Yes, I started out Catholic and still am Catholic. The word Catholic means universal. My faith has taken me to a deep level of universality where I find a profound harmony by moving deeper than dogma. I am extremely grateful to all people of good will who have sought the sacred over the centuries and to those who do so today. Another reason for my deep gratitude comes from many years of attempting to live the Gospel in the spirit of Saint Jane de Chantal and Saint Francis de Sales. This has helped me to keep my focus where it is most life-giving—my relationship with Jesus Christ. Salesian spirituality is not given to dramatic spiritual experiences or lots of externals. Perhaps it is Saint Jane’s influence as a wife and mother, along with Saint Francis’ that has made this spirituality so androgynous and free of prejudice toward other spiritual paths. In a world in which prejudice and violence are experienced everyday, and then viewed each evening in living color on the television news, it is a joy to find Jesus in the midst of diversity. Empirical studies demonstrate that extreme Aletter of the law@ religion easily spawns prejudice while Aspirit of the law@ religion is remarkably free of prejudice. May the whirlpool of various traditions created through centuries of longing foster only Good News!